Arterial blood gases (ABG's) is a blood test which is used to give an indication of ventilation, gas exchange and acid-base status and is taken from an arterial blood supply. It should be noted that it is not to be confused with venous blood gases which are used when arterial supply is not available or unreliable due to disease. The line in is usually inserted in the radial artery located at the wrist but is also sometimes used in the femoral artery in the groin. This is important to consider when moving and handling a patient as it is easy to catch a line on an object or clothing and care needs to be taken. It can be argued that one of the most important clinical uses of ABG analysis is to assess if a patient is in Type 1 (Hypoxaemia) or Type 2 respiratory failure and it is important that as physiotherapists we able to quickly and correctly interpret this. ABGs give us information about the activity in both the respiratory system and the 'metabolic' system. If one system is disturbed, the other will try to restore the balance or compensate. Both systems work together in an attempt to keep pH in the normal range. They are commonly used to; identify acid/base disorders, identify gas exchange problems, monitor the effects of oxygen therapy. Pa02: Partial pressure of oxygen in the blood. Reflects acid-base balance and responds to metabolic and respiratory changes. Body cells and chemical reactions are acutely sensitive to the pH of their environment. Acid-base balance is disturbed if; CO2 removal by the lungs is abnormal, production of acid from tissues is abnormal, and removal of acid is abnormal. The respiratory component that reacts if the buffering system is not enough and the lungs help my regulating CO2. The Metabolic component and is the last mechanism to work and begins to eliminate acid. Metabolic acidosis involves excess fixed acid production, i.e. lactate or loss of HCO3.It occurs when the body produces excess quantities of acid or the kidneys are not removing sufficient acid from the body. If left untreated, metabolic acidosis can lead to acidemia. Acidemia occurs when the bloods pH is low (<7.35) due to an increased production of hydrogen ions by the body or its inability to form bicarbonate (HCO3) in the kidneys. Respiratory alkalosis is caused by over excretion of carbon dioxide (hyperventilation) resulting in more CO2 than normal being exhaled. Thus, leading to a reduction in free hydrogen ions and an alkalotic state. Metabolic alkalosis occurs as a result of decreased hydrogen ion concentration which leads to increased bicarbonate, or alternatively a direct result of increased bicarbonate concentrations. Respiratory failure is characterized by a reduction in function of the lungs due to lung disease or a skeletal or neuromuscular disorder. It occurs when gas exchange at the lungs is significantly impaired to cause a drop in blood levels of oxygen (hypoxemia) occurring with or without an increase in carbon dioxide levels(hypercapnia). It's usually defined in terms of the gas tensions in the arterial blood, respiratory rate and evidence of increased work of breathing. Respiratory failure can be acute, chronic or acute on chronic. It's a major cause of mortality and morbidity and mortality rates increase with age and presence of co-morbidities. Respiratory failure is not a disease but a consequence of the problems that interfere with the ability to breathe. The bodies pH is closely controlled and this is done through various mechanisms to maintain it at a constant value. It is important to note that the body will never overcompensate as the drivers for compensation cease as the pH returns to normal. 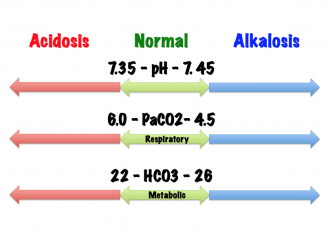 In practice, compensation for an acidosis will not cause an alkalosis or visa versa. If pH is NORMAL despite an abnormal PCO2 and HCO3 it must be compensated. Look at the pH - Which side of 7.4 is it? When PaCO2 is high, but pH is normal instead of being acidic, and if HCO3 levels are also increased, then it means that the compensatory mechanism has retained more HCO3 to maintain the pH. When PaCO2 and HCO3 values are high but pH is acidic, then it indicates partial compensation. It means that the compensatory mechanism tried but failed to bring the pH to normal. If pH is abnormal and if the value of either PaCO2 or HCO3 is abnormal, it indicates that the system is uncompensated. This is probably because of either respiratory or metabolic acidosis. 1.A 1mmHg change in PaCO2 above or below 40 mmHg results in 0.008 unit change in pH in the opposite direction. 3.A change in [HCO3-] of 10 mEq/L will result in a change in pH of approximately 0.15 pH units in the same direction. The results should always be read and compared in reference to the patients previous ABG (if available) as you will then be able to assess a trend and make a more accurate assessment on whether you should treat or if your treatment has be successful or not. 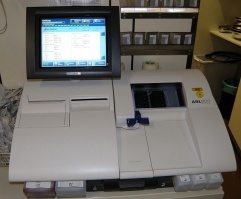 ↑ 2.0 2.1 2.2 2.3 2.4 2.5 Woodrow P. Arterial blood gas analysis. Nursing Standard (through 2013). 2004 Feb 4;18(21):45. ↑ Buck RP, Rondinini S, Covington AK, Baucke FG, Brett CM, Camoes MF, Milton MJ, Mussini T, Naumann R, Pratt KW, Spitzer P. Measurement of pH. Definition, standards, and procedures (IUPAC Recommendations 2002). Pure and applied chemistry. 2002 Jan 1;74(11):2169-200. ↑ Kenyon K, Kenyon J. The Physiotherapist's Pocketbook. Essential Facts at your Fingertips. 2nd ed. London: Churchill Livingstone, Elsevier. 2009. ↑ Krieg, Brian J.; Taghavi, Seyed Mohammad; Amidon, Gordon L.; Amidon, Gregory E. (2014-11-01). "In Vivo Predictive Dissolution: Transport Analysis of the CO2, Bicarbonate In Vivo Buffer System". Journal of Pharmaceutical Sciences. 103 (11): 3473–3490. ↑ 7.0 7.1 "Respiratory alkalosis: MedlinePlus Medical Encyclopedia". www.nlm.nih.gov. ↑ 8.0 8.1 Singh AK. Metabolic alkalosis. In: Mushlin SB, Greene HL II, eds. Decision Making in Medicine: An Algorithmic Approach. 3rd ed. Philadelphia, PA: Mosby Elsevier; 2010. 374-5. ↑ 9.0 9.1 Respiratory Failure. (2017, October 5). Physiopedia, . Retrieved 10:12, March 27, 2018 from https://www.physio-pedia.com/index.php?title=Respiratory_Failure&oldid=179534. ↑ Stoeltin RK, Miller RD. Basics of Anesthesia, 5th ed. Philadelphia: Churchill Livingstone, Elsevier. 2007.